Today is Altenew Build-A-Flower product of the month mini-release. This month it’s Build-A-Flower: Hibiscus. Our Build-A-Flower: Hibiscus set includes 1 stamp set (24 images) and 1 coordinating die set (3 dies). And here is the card I made using new set. I decided to go with tropical, hot and exotic color scheme for this card. First i stamped the flowers and leaves and die-cut them using matching dies. Next I inked a Solar White Cards base using Caramel Toffee Dye Ink and added some splatters with this ink. I made a floral cluster and adhered it onto the card. Added two sentiment stripes white embossed onto a Jet Black cardstock. Several clear droplets finished off my card. To celebrate this release, Altenew is giving away a $30 gift certificate to six lucky winners! Please leave a comment on the Altenew Card Blog and/or Altenew Scrapbook Blog for a chance to win. Three winners will be announced on the Card Blog, and other three winners will be announced on the Scrapbook Blog on 4/8/2018. I will also randomly choose a winner from comments left on this post and the prize will be $20 gift certificate to Altenew online store. Please leave a comment on this post by 04/05/2018 for a chance to win. I will announce the winner here on this post on 04/06/2018 as well as on the winners page. The winner of $20 Gift Certificate is Angie F.
love the contrast of the colors you used to make your card. thanks so much for sharing. Such a lovely card.. that pink is gorgeous. Hi, Beautiful card and that is a really pretty flower. Nice color combo also. Did you change your profile picture? I did a double take when I signed on today, I thought I had the wrong blog, or If you didn’t change it, I am sorry, I have had one of the worst weeks of my entire life, so I am not entirely thinking straight lately so just ignore my question, sorry. I’m so so sorry that you had the worst week. I hope all is good now (or will be soon). I like the colors you chose for your creation. 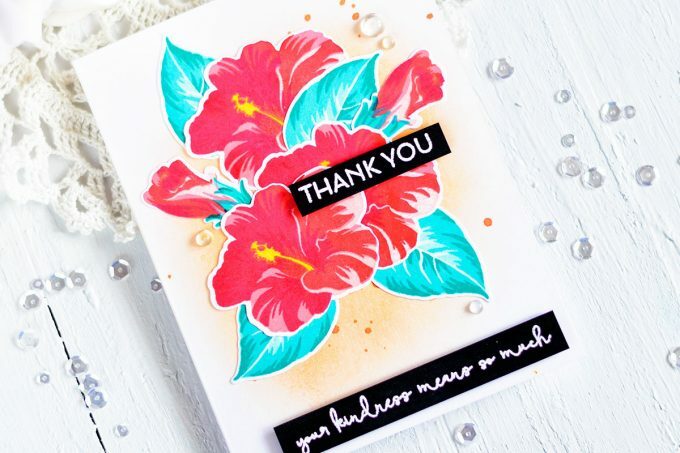 Such a pretty card – love the tropical colors. Beautiful card! Love the colors and background technique! Can’t wait to get this set. Lovely card! Such a gorgeous stamp set! I can’t wait to get it and start creating! I love the layering and bright colors! A great new profile pic Svitlana, I wasn’t sure it was you with the dark hair. You look lovely though. Your card is beautiful and this is a great flower to achieve a tropical feel, your succeeded beautifully. Lovely hibiscus flowers in beautiful colors! Gorgeous card! LOVE the inky layers of your flowers and leaves, the colours delight, the delicate background does too! LOVE the card! The colors are so lovely. Splendid colors on the card. Breathtakingly beautiful!! Super pretty card!! Lovely design and colors! I had to do a double take of who you are, thought you were someone I recognized until I saw your photo. You look so different! I love it. Just like I love your card. I love the color of the leaves. So different and very pretty. Fabulous card! Wonderfully vibrant and tropical color combination. The colours pop brilliantly !! I love the blue leaves. It’s really eye catching. What a great new stamp set and BEAUTIFUL CARD….. love your bold colors and the pretty background you created. What a beautiful stamp set. I love your card with the soft blending in the background – it’s gorgeous! I love the soft background with the vibrant flowers, and your wonderful flower arrangement with the added splatter. It all makes for a stunning card! I am going to have to try re-create a similar look. I hope you don’t mind me borrowing your ingenious design for a card. Gorgeous card and excellent choice of colors. The soft background looks so elegant. Thanks for sharing. Beautiful card. 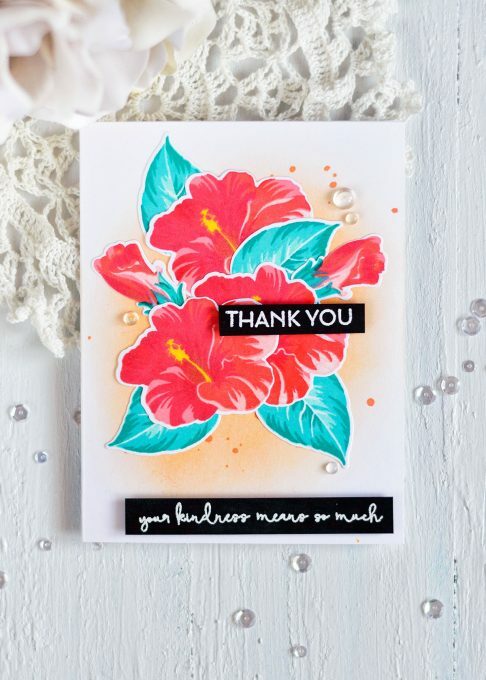 Loving the layering hibiscus stamp set. 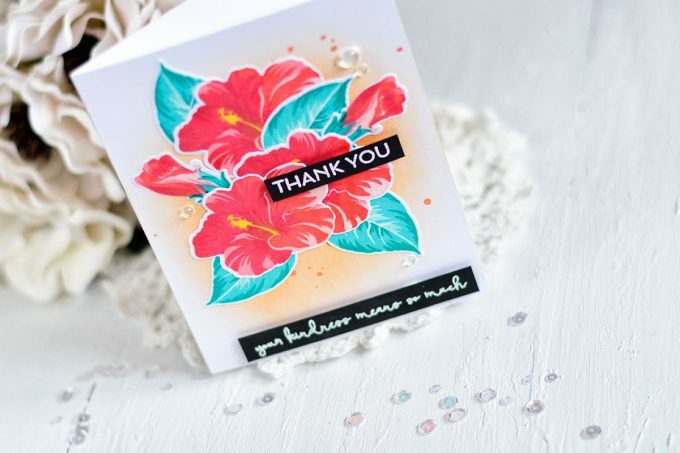 Love the bright tropical colors on your hibiscus card! 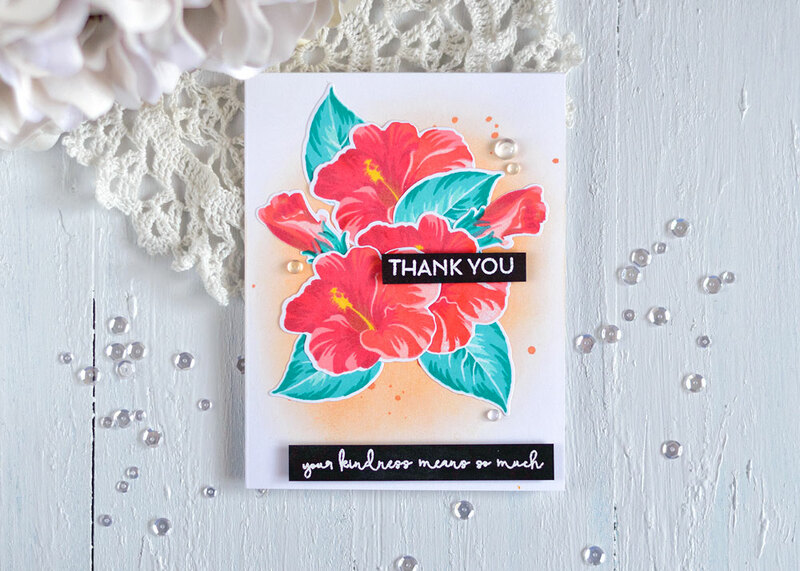 Pretty hibiscus card, so tropical looking with this awesome color combo and the soft orange background. Your colors are magical and really showcase the beauty of these images! TFS! What gorgeous shading on your flowers! This is a beautiful color combination and a great card! Beautiful! The red and turquoise is such a striking color combination. Thank you for sharing your card. It’s nice to see how the newer ink colours look with the new stamp set. I think the hibiscus set is my favourite so far!! Oh boy! Another strikingly beautiful flower for my collection. The 6 layers definitely makes all the difference! Your card is lovely – the colour combinations you use always amaze me. 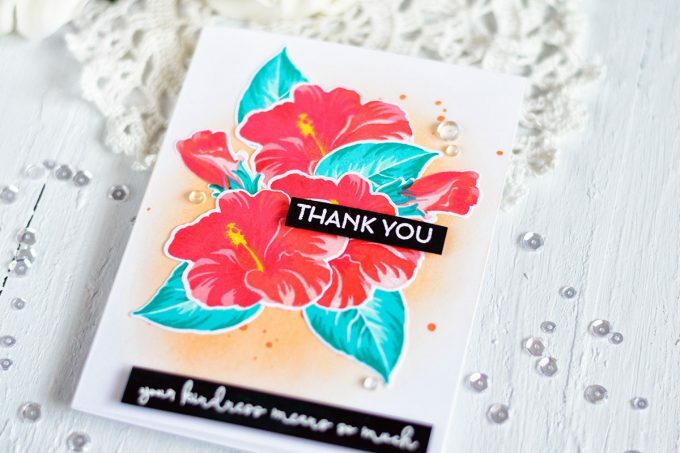 This is a beautiful card, and I really like hibiscus flowers. The caramel color is pretty as a background color. Thank you all for your generosity. Beautiful! Being from Florida and surrounded by hibiscus trees, I am amazed how realistic the flowers are. Loving the colors you used for the leaves and how the pop with the red flowers! Those are the perfect shades of red for the hibiscuses. And I like the unexpected teal leaves behind them. Thanks so much for sharing your ideas with us! Love how the tropical theme came out and the extra details with the clear round drops give it such a “cool” look! As always, love your color scheme! The extra details with the clear round dots look amazing! Sorry! My comments seem to not be working for a while, but then popping up after I check back. So, I’ve written two comments on some of your posts. Love your cards though! What a great card! Love those vibrant colours! I like this stamp set so much I have to buy it. Wow! Such bold color! Love it! Congrats on moving to the US. I hope you have a happy forever home here! I’ve subscribed to your blog. I think you’re an amazing artist and I get so much inspiration looking at all your beautiful cards!